"Ch 200." (Or 62, or 135, or whatever the pattern calls for.) 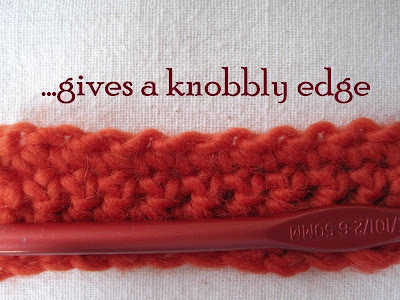 These are the words that strike dread into the heart of all but the most intrepid crocheters. Why dread? Because chain stitches tend to tighten up, making it very hard to work the next row of your pattern. Chaining loosely - which works very well if you have Perfect Tension Control (I don't). 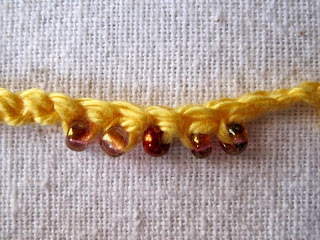 Using a larger hook for the starting chain - can work, but can also leave a sloppy edge. Replacing the starting chain with Foundation Single Crochet or one of its taller variations**, as popularised by crochet genius Doris Chan (may she live long and prosper) - I heartily recommend this technique, but admit that it can be awkward for crochet newbies and oldbies alike. 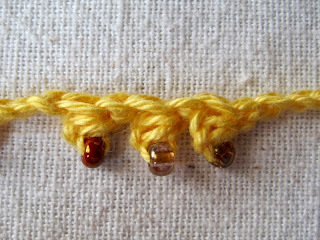 Replacing the starting chain with a band or series of loops, stitched vertically, that following rows can be stitched into - I recommend this technique also (see my Laurel Leaf Scarf for an example of the first, and my Summery Cowl for an example of the second). Caveat #1: the Forward Loop Chain, though stretchier than a standard chain, does not have perfect recovery. 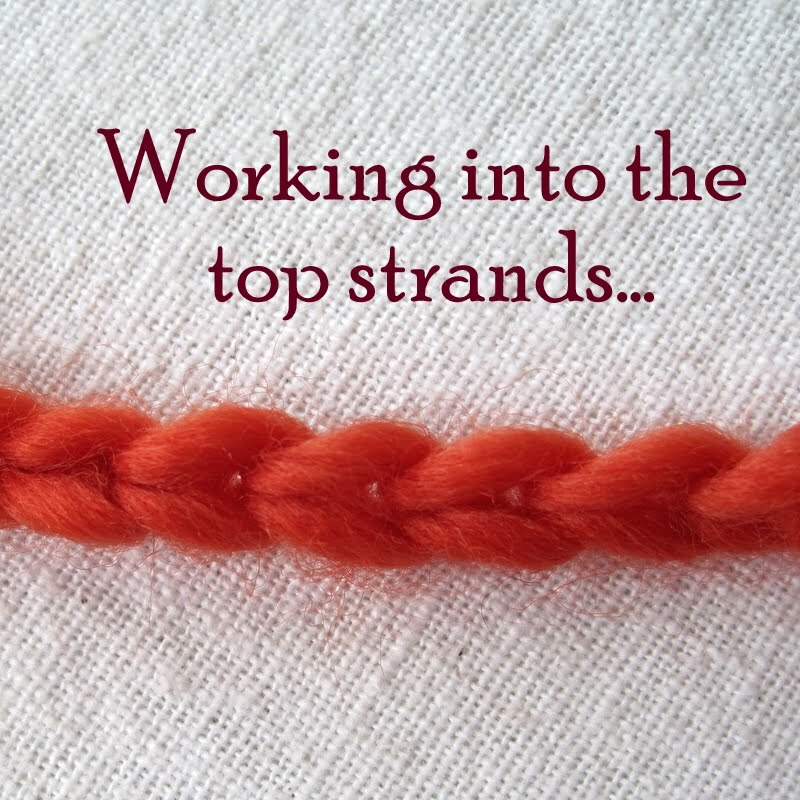 Don't use it for tension-bearing edges that will be repeatedly stretched - such as hat bands or garment necklines - unless at least one round of border stitches will be added later. A Foundation Crochet stitch would be a better choice for these applications. 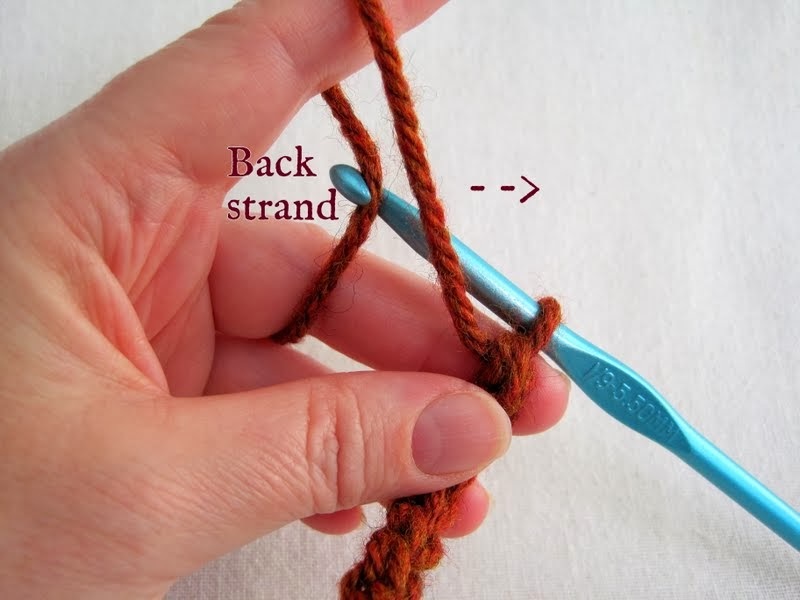 Caveat #2: Because of its stretchiness, the Forward Loop Chain works best with stable, grippy yarns: I have had great results with wool, acrylic, cotton, and blends of the aforementioned. Very sproingy yarns should also work well. Exercise caution with slippery yarns (such as bamboo or silk blends), or yarns that tend to compress (Schoppel Wolle Gradient comes to mind); if using yarns like these, make your Forward Loop Chains very firm and tight - they will relax when worked into. (You might even want to size down your hook.) As always, be sure to swatch for best results. 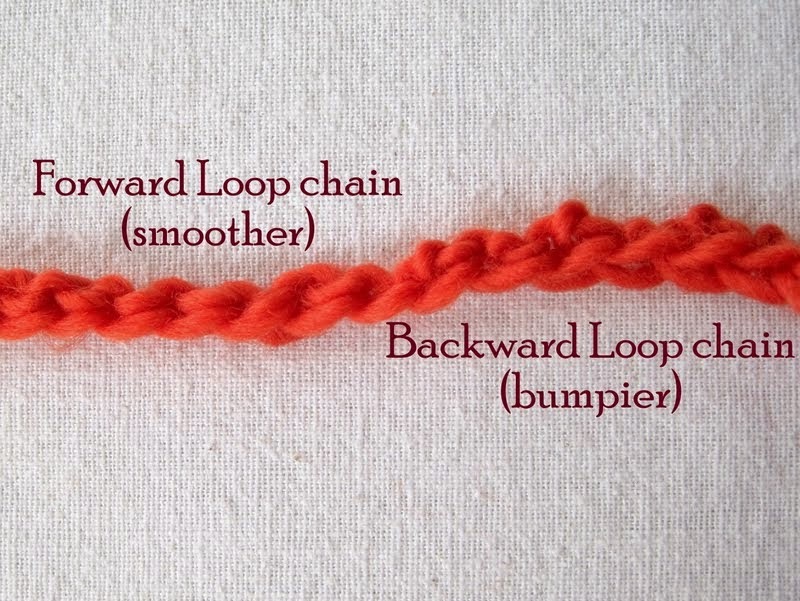 What gives the Forward Loop Chain its texture? 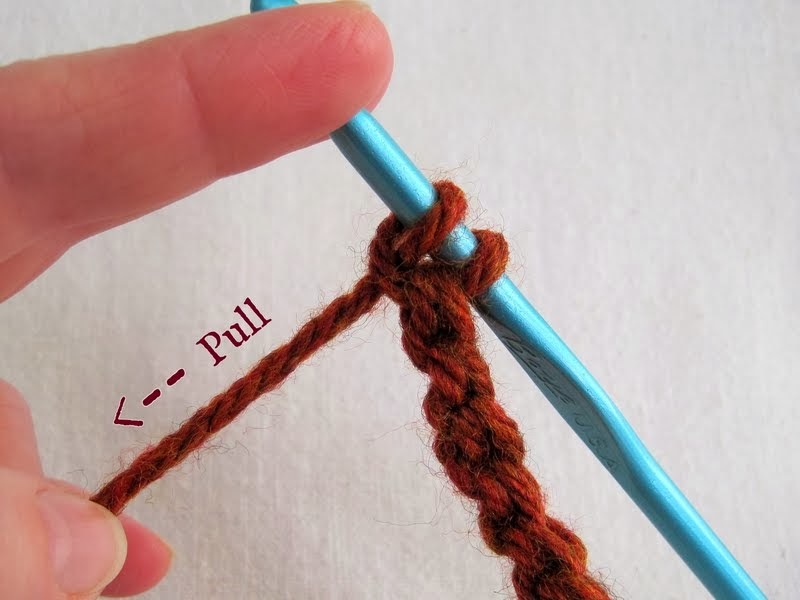 A technique borrowed from knitting: the cast-on loop. 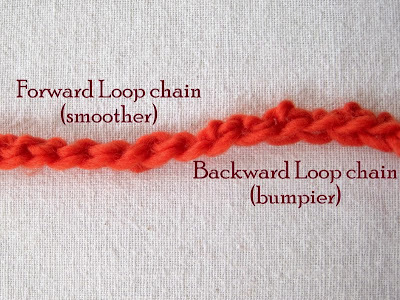 Knitters most commonly use a Backward Loop, but the Forward Loop Chain takes advantage of the working yarn's natural flow over the crocheter's forefinger to make quick and easy work of casting on an extra loop with each stitch. 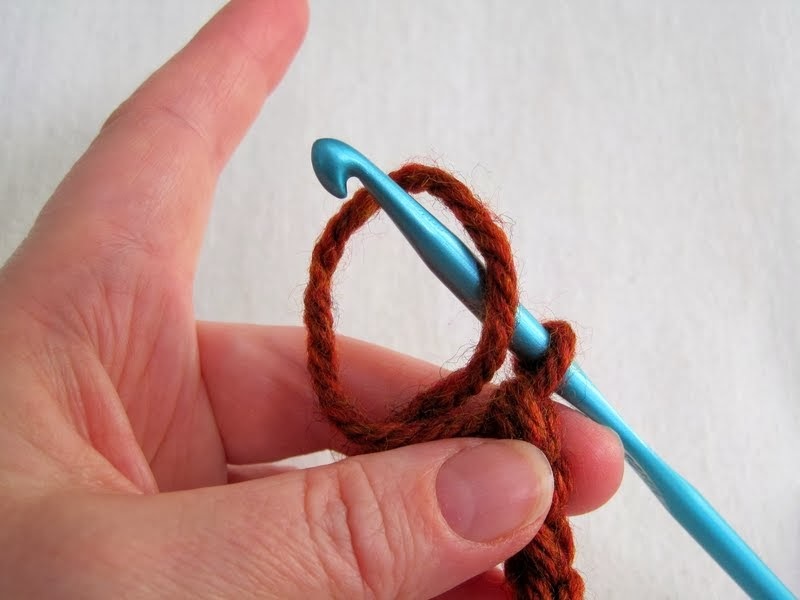 Adding this simple loop to your hook will take your humble crochet chains to new levels of body, stability, and elegance. Very Important Tip: Don't let your loops get choked up around the narrow neck of the hook - keep them farther down, around the full width of the hook (as in the photos above). 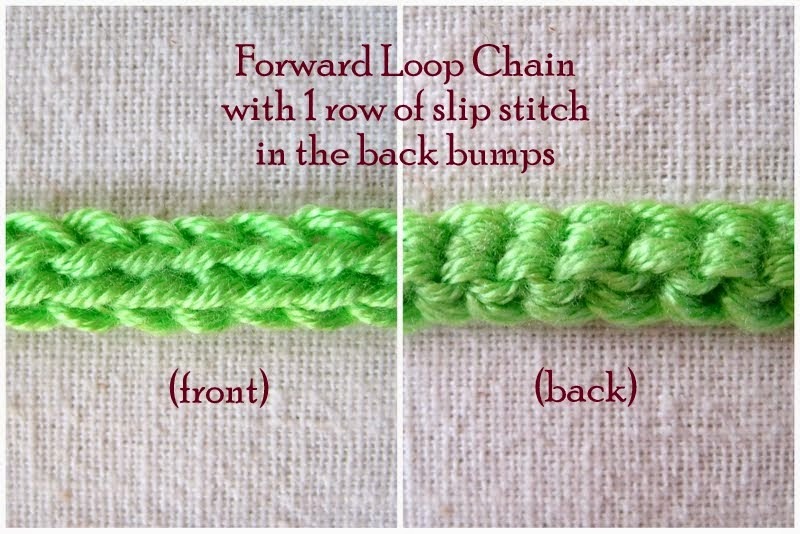 This will give you the smoothest Forward Loop Chain, with perfect tension for adding your next row. The Forward Loop Chain offers two sides to work into. The side you choose to work into will determine the texture of your project edge. 1. 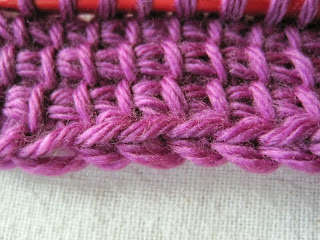 I like to work into the bottom edge, which consists of a row of linked bumps. 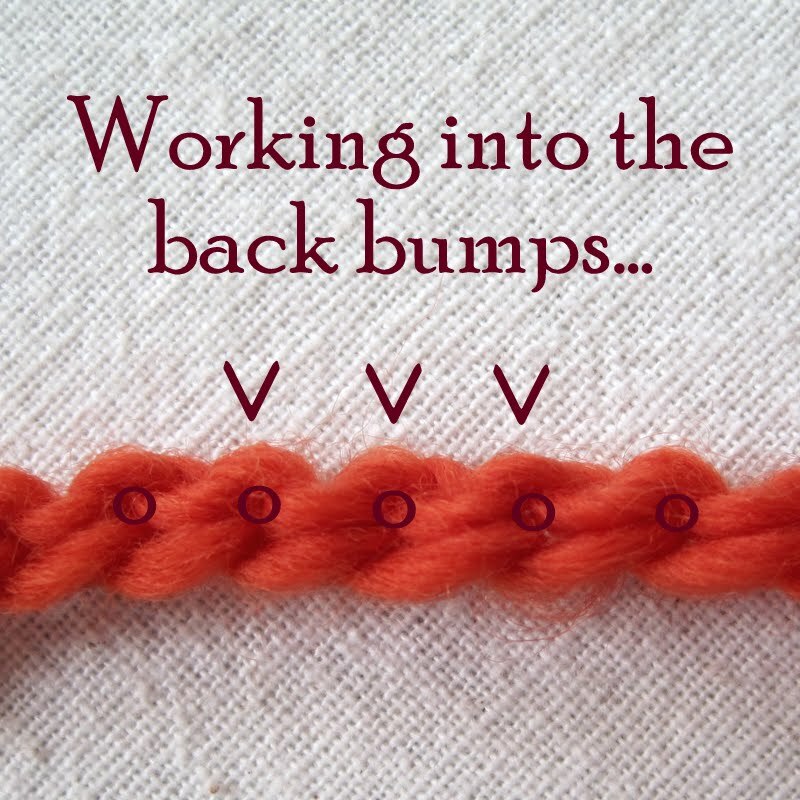 These bumps form tiny holes which are are delightfully easy to get your hook through (the holes will appear when the chain is slightly stretched - see video tutorial above for an example of this). 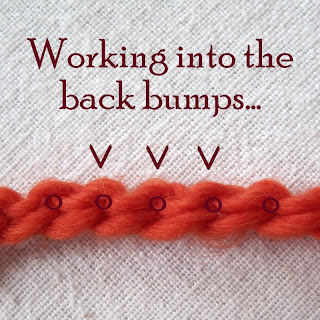 Depending on your yarn, working into the back Bumps can also give a slightly lacy look to your edge, as the holes may open up and form a row of small eyelets. If this is a problem for you, work your Forward Loop Chains tightly, or consider downsizing your hook (I can't believe I'm saying that for a starting chain!). 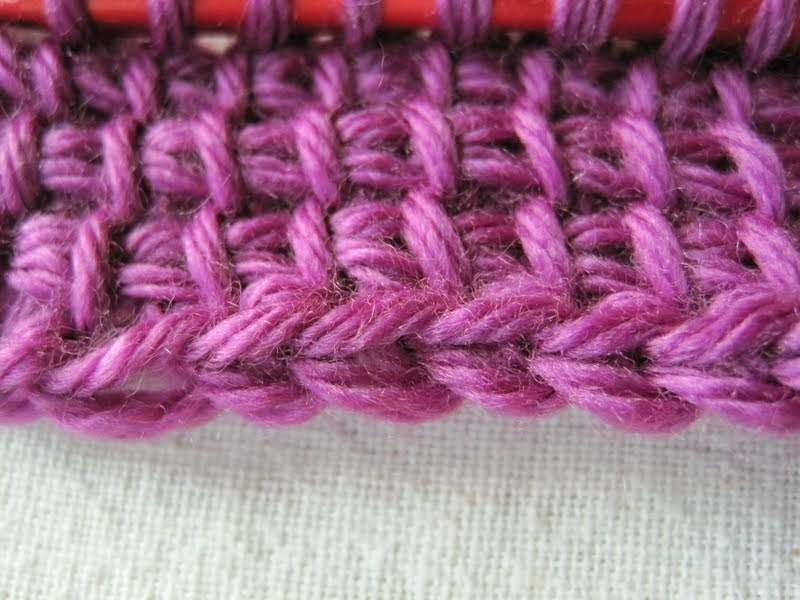 Frogging and working the first row more than once can also open up the holes, so be sure to swatch and work out any potential issues before you start your project. 2. 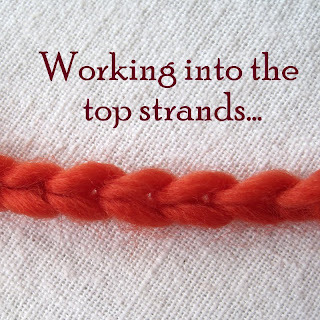 Then we have the top edge, which looks like a standard chain stitch. 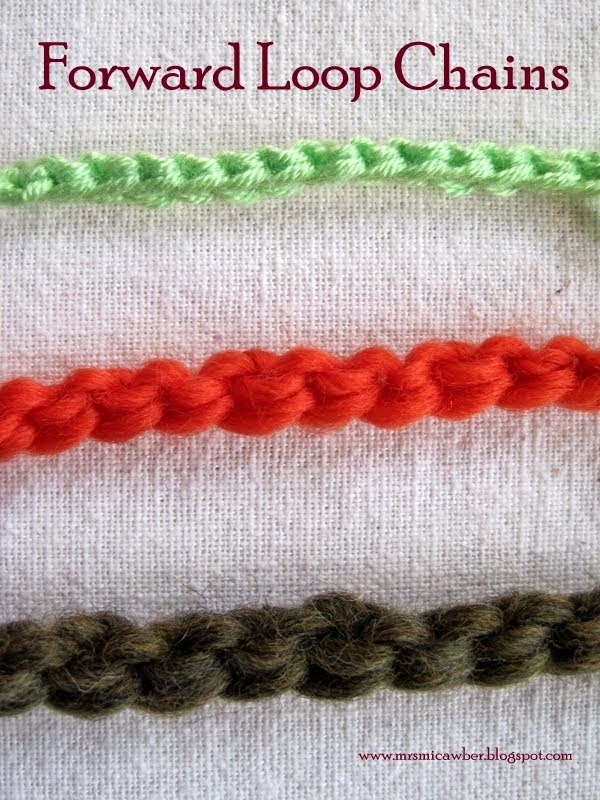 Whichever side you choose to work into will leave a project edge that can easily be added to later - no more struggling to get your hook into the tight starting chain! 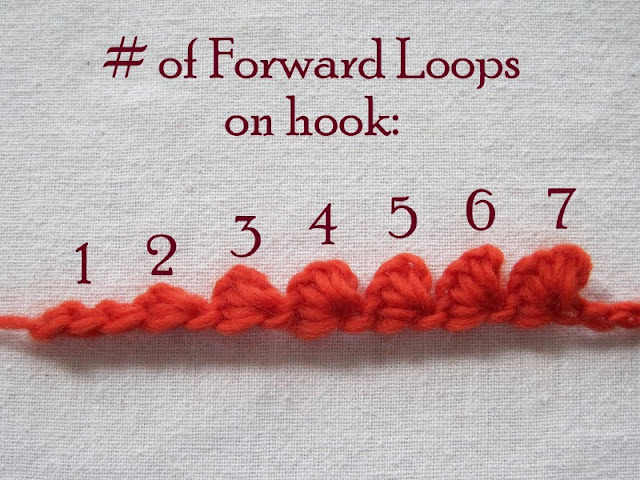 When you have completed your Forward Loop Chain, decide which side you will work into. This will determine whether or not you need a turning chain(s). 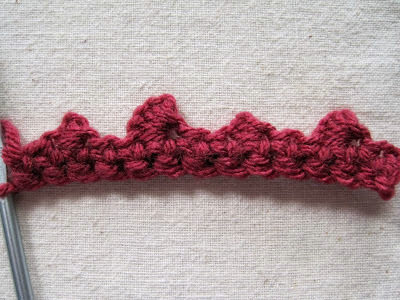 If working into the Back Bumps with a row of slip stitches, single crochet, or Tunisian - do NOT ch 1 for turning (the final Forward Loop Chain will act as both final starting chain and turning chain - and also provide the first "hole" you work into). 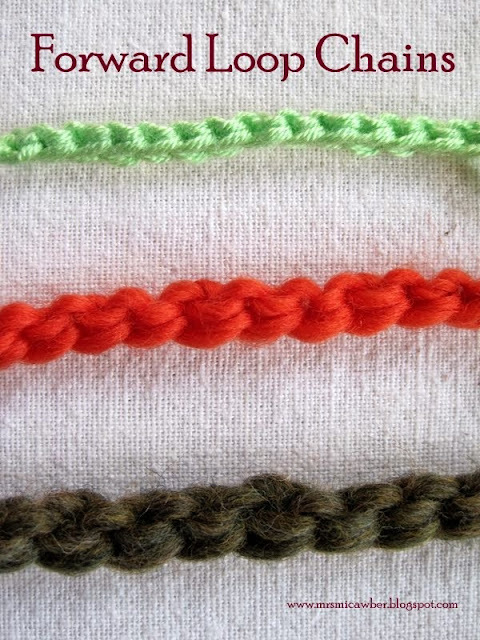 If working into the Top Strands - use Forward Loop Chains for all but the turning chain, and chain the normal amount (of regular chain stitches) for turning. 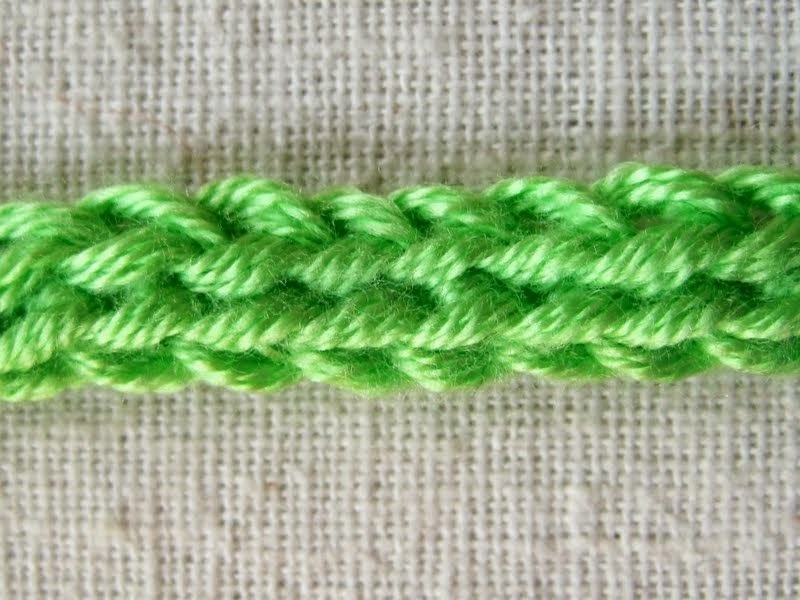 Anything taller than a ch-1 will count as the first stitch of the row. 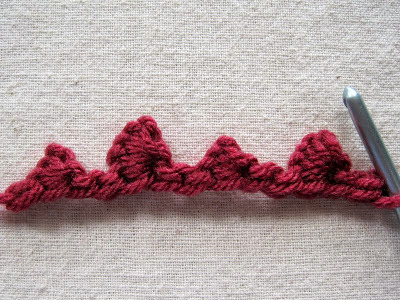 Limpets are a long-established but rarely-seen crochet technique, traditionally made with Backward Loops - but as you can see, they work equally well with Forward Loops. Limpets can also be used to form part of a crochet fabric (see links at the end of this post). 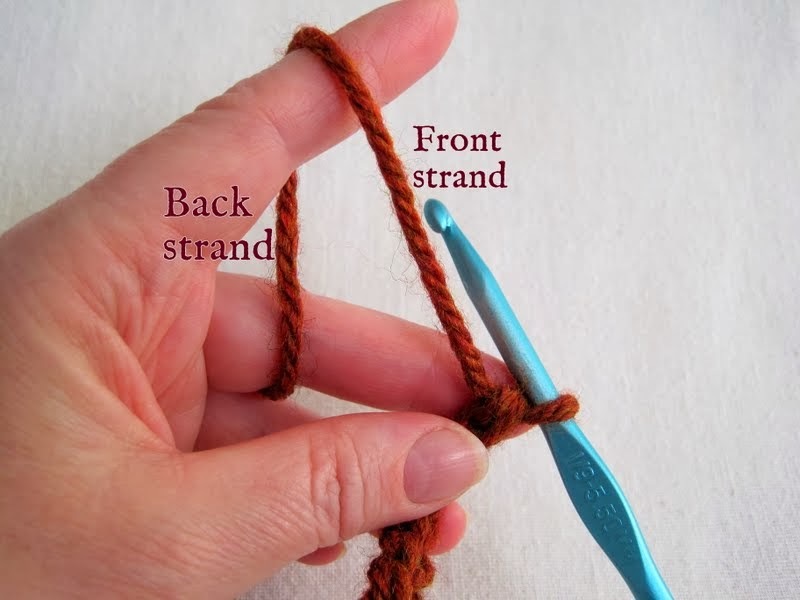 Easy Limpet Trim: *Cast on the desired number of Forward Loops, yarn over, and pull through all loops on hook; ch or forlpch 1. Repeat from *. Again, you may need to gently pinch the edge of the Loops as you pull the yarn through. 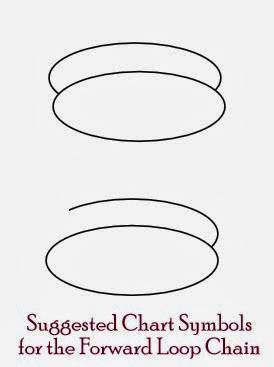 Note: Limpets work best as a starting project edge rather than an ending edge (in my opinion). Though it's possible to add them to the final row of a project, each limpet must be slipstitched down or attached in some way - which will change its shape and appearance. 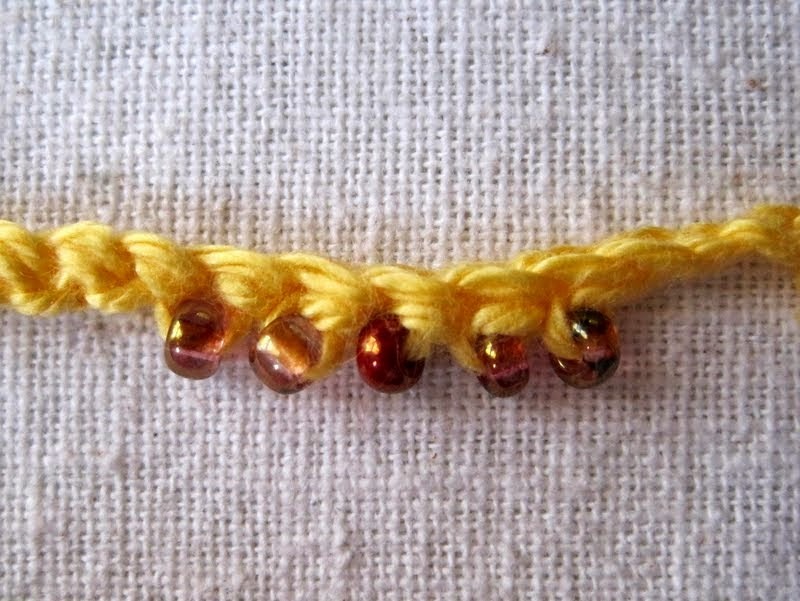 ~ Try adding beads to your Forward Loops: cast on the number of desired loops, slide a bead down close to work, yarn over, pull through all loops. I've been using the Forward Loop Chain (and variations) for several months, and I think it's full of exciting crochet potential. I hope you find it useful too. 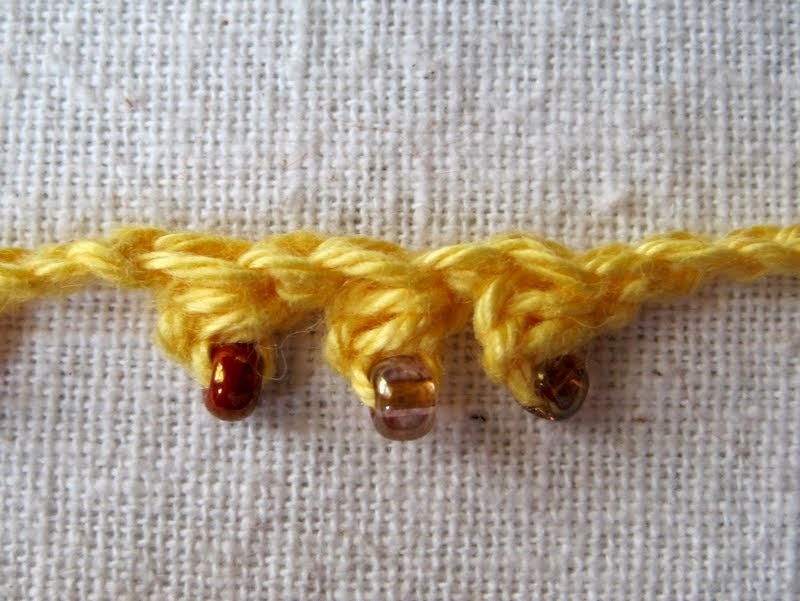 Later this month, I'll post an Autumn-themed free necklace/bracelet pattern featuring the Forward Loop Chain. This is genius. I also kind of "invented " those various chain alternatives some time ago, but wasn't able to put it in words (even in my native tongue) nor in pictures. Very interesting post. I shall have a play. What an interesting post, Sue. I have often had problems with getting my hook into that foundation chain. I'm definitely going to try this next time. Thank you for sharing! Sue, once again I have to tell you that you are brilliant! 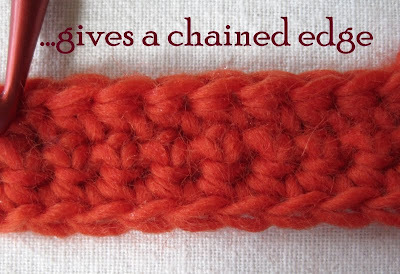 I could have used this info this past week while working on two cowls and using the plain old chain method. I want to make another cowl right away to see how it works. Tallulah is already for Halloween, she must be thrilled with her costume. Sue, you are the most incredible mine of information and ideas, all bookmarked against the day I get the hang of those darn hooks! So relieved Talulah has an outfit for Halloween. Very cool helpful tutorial! Love love love! So tired of foundation sc and ch issues... can't wait to try. Thank you so much for the tutorial!!! 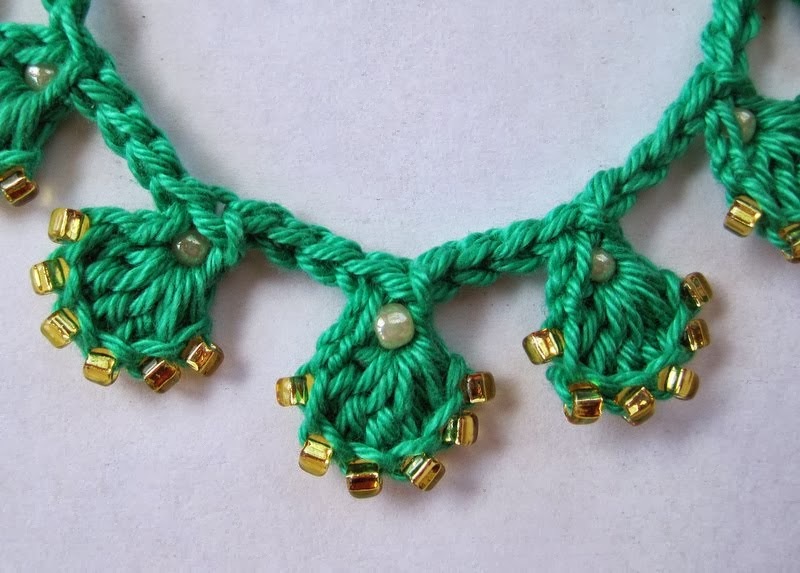 You are using the tatting double knots from crochet tatting (crotat) for foundation chain! Very clever idea!! Many possibilities! I love this post! So many techniques but it's great to see all info in one place! Thank you so much for sharing! I'm a newbie to Craftster.com but, boy, am I glad I dropped by today! I am going to start :/ this tomorrow after my surgery. Too much to do tonight, including getting some rest! I've learned foundation chains to deal with those tight chains at the bottoms of project but sometimes they are SO frustrating. This methinks is gonna be FUN! Thanks a GAZILLION! Thanks for adding to my tool set! Half hitching was all I retained from ancient knitting lessons and only knew it for limpets. 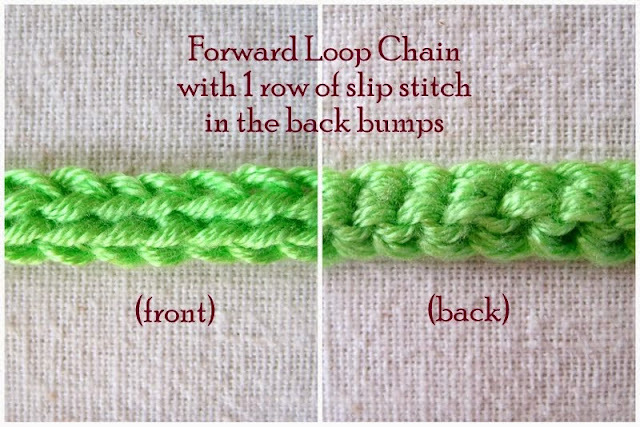 Forlpch (Forward Loop Chain) is lovely! 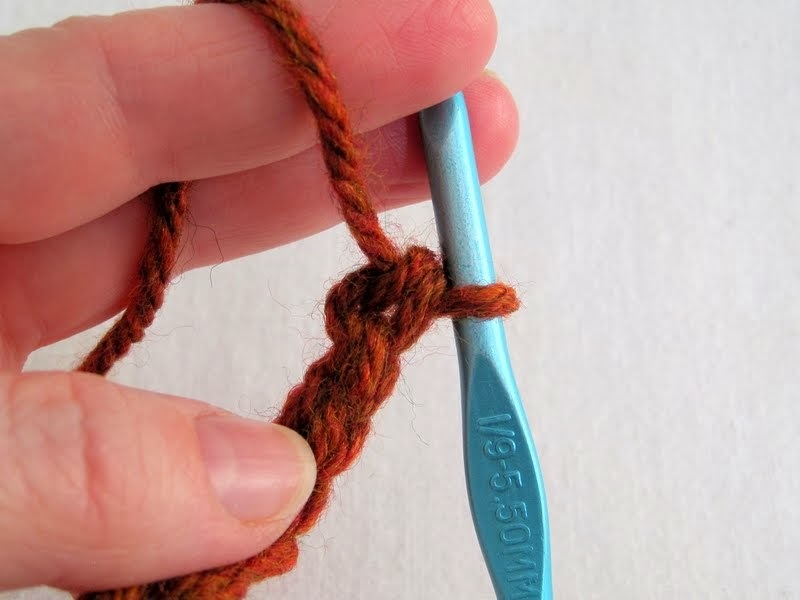 Actually, the forlpch can be done with the assistance of a circular knitting needle - maybe a little faster. The needle size determines the tension of each chain st.
5. Slide all the stitches to the other end of the circular needle, hold the end with all the stitches in your lh and use the other end of the circular needle to slip the first two sts to the rh needle, sl the first (rightmost) over the second, slip the next st to the rh needle, sl the first over the second, repeat until there are no stitches left on the knitting needle,and all you have is the forlpch attached to your working yarn and just the one live loop which you can slip back onto the crochet hook and remove the marker. 6. If you find the chain is too short, add more ch sts incorporating the circular knitting needle as described above. So if you were knitting, this would be the most minimalist cast-on-bind-off technique possible. 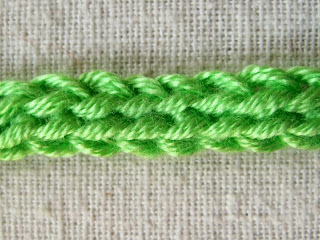 ** Steps 1 - 4 combine the two steps of a crochet cast-on since you don't have to hunt down those back bumps - they're already on your needle, but if you are casting on for knitting, make one ch st less than required, don't insert a stitch marker, just slip that live loop on the lh knitting needle as your last stitch, and you're ready for Row 1 or Round 1. Somehow when I read this it doesn't seem faster, but that's probably because describing an action in words is so much more cumbersome than simply performing it. :) What you describe sounds more like the Crazy Simple 2-Stitch I-cord than the forlp ch (which is where this comment was posted). 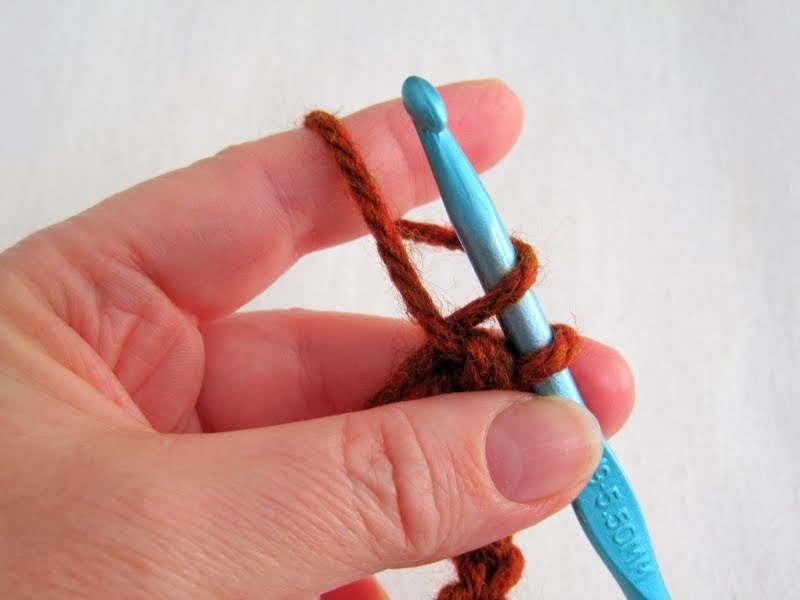 It would indeed be a very minimalist cast on/bind off. What I find most intriguing is that the same structure can be achieved in more than one way. It's almost magical. I'm Mrs. Micawber ... but you can call me Sue. 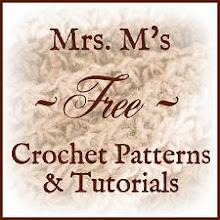 LOOKING FOR PATTERN OR TUTORIAL? WHO'S MR. MICAWBER, AND WHAT'S HIS RECIPE? The lovable spendthrift from David Copperfield who offers the young hero this financial advice: "Annual income twenty pounds, annual expenditure nineteen nineteen six, result happiness. Annual income twenty pounds, annual expenditure twenty pounds ought and six, result misery." In short: live within your means. 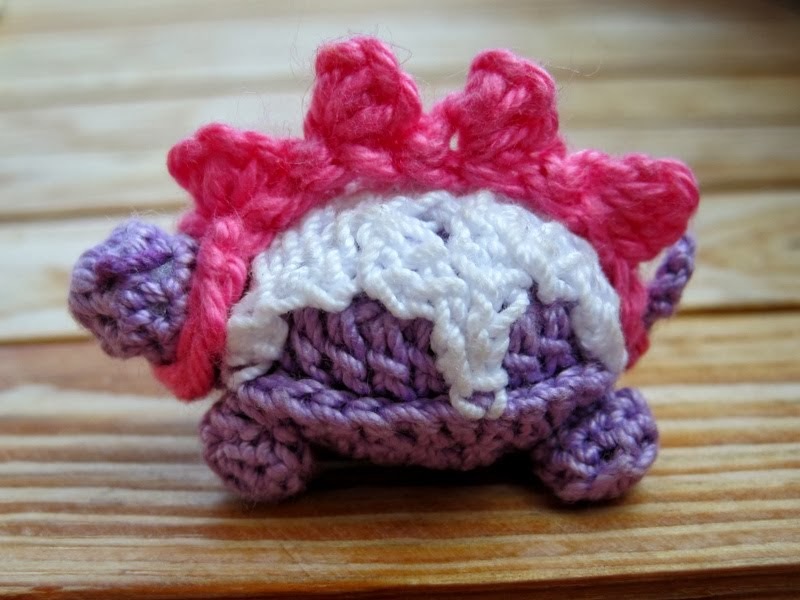 Oh, look - it's some knitting! Filet Crochet Gauge Tips: Tunisian Crochet Filet Too! Books, Baking and a Bunny! Complete Anglophile. Captain of the local Grammar Police, but wanted by the Fashion Police for crimes against the state. Would live in jeans if I could. Least likely to win a Good Housekeeping Seal of Approval for diligence in housework. Secret fantasy: to take a pastry chef course. No, scratch that: to live in England for a year. Happily married for over a quarter century. Blog header and blog post title fonts are modern digitised reproductions of types from the collection of John Fell, Bishop of Oxford (1676-1686). "The Fell Types are digitally reproduced by Igino Marini. www.iginomarini.com"